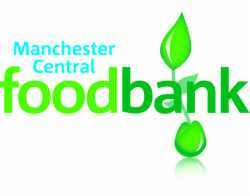 Here in Manchester – we are about to open the first student-run foodbank in the country. We have been working with the Trussel Trust (TTT), a Christian charity who currently support the biggest network of foodbanks in the country. The alarming rate of growth of foodbanks is a direct response to two conflicting trends in British life. The growth of ‘food poverty’ : as globally food prices rise, energy prices rise, but locally wages stay still or decrease, those with a basic income are finding it harder and harder to put food on the table. The second trend is the cutting of benefits, and the dismantling of a bloated welfare state. With pressure on local agencies to withhold benefits for the slightest misdemeanour, those accustomed to relying on this are finding themselves in emergency situations, where they may have to wait a few weeks before any income resumes. So foodbanks are popping up all over the place, often but not exclusively in churches – to provide short-term emergency assistance. The TT model that we are following, provides a referral service, where those in crisis can be referred to us for food parcels by a variety of front-line agencies. People don’t just walk-in off the streets, it is not a drop-in centre they must be referred with vouchers. These are also limited to three per six months, so it is not creating dependency but rather providing an emergency – short term crisis service. The vouchers also ensure that a sophisticated monitoring process can go on to find out the causes of these crises, and spot any patterns emerging. It was interesting to see that TTT was able to identify a spike in demand during the summer holidays as free-school-dinners were not available to struggling families. Present at yesterdays training day – here at the chaplaincy – were representatives from the council, the huge local hospital, schools, churches, sure-start centres, job-centers, charities etc. It was a an impressive kaleidoscope of civil society, the ill-fated ‘Big-Society’. The scandal of food-poverty in such a wealthy society – for me points more towards the breakdown of the extended family rather than free-market politics. Like many post-industrial societies we are in a much-needed reform of the welfare state, but when the family is not there to pick up the pieces – more strain is put on civil-society as big-government withdraws. However dirty politics also reared its head yesterday. It turns out that the job-centres, who are enthusiastic referrers to food banks, at times verging on the irresponsible, using us an excuse to meet quotas, cut corners. The job centres refuse to use the voucher scheme as sanctioned by TTT. 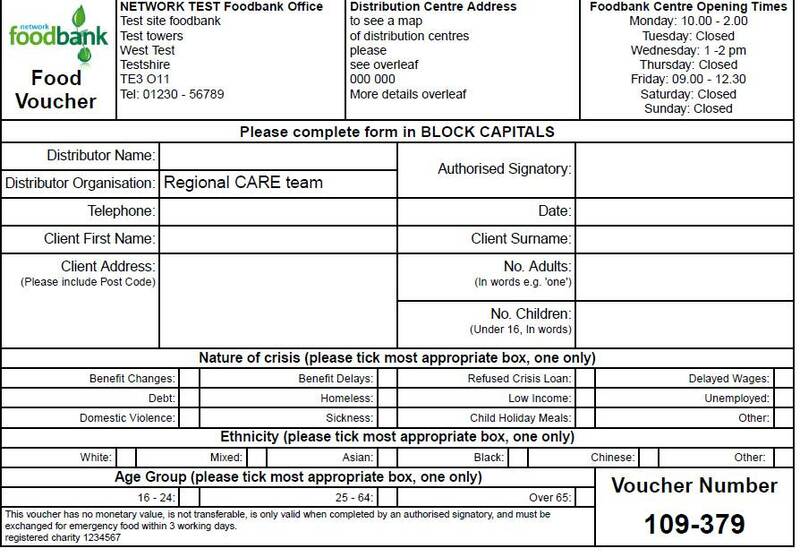 Why – because much of this food poverty is hidden – but the monitoring system TTT uses allows for the identification of the cause of the crisis and this is an embarrassment for the Dept of Work and Pensions (DWP). On the voucher it is indicated why someone is in crisis, e.g sickness, benefit delays, domestic violence, debt etc. It seems that although there was an agreement with TTT and DWP back in 2011, DWP have acted unilaterally and changed it – refusing to use TTT’s vouchers. It may be that the TTT network is so extensive and successful now, but also they are so good at data gathering that this is embarrassing the government. They are happy to dump people on the TTT, but not happy for statistics to get out about how the changes are effecting people – now that is Scandalous!